Volume 13 | Cristanini Decontamination Systems: Keeping Things Simple! Cristanini Decontamination Systems: Keeping Things Simple! Q: Could you tell our readers where you think CBRN is right now in terms of defence and security priorities? A: I think it is right up there at the strategic level and then down at the very bottom where you find those who are directly tasked to deliver CBRN capability, but in between, it’s all a bit vague. I would say this is generally because CBRN is a low probability event, with a lack of enduring precedent leading to a knowledge deficit; nevertheless CBRN represents a level of risk that on manifestation could have very serious, dare I say catastrophic consequences, in both the defence and security domains. It is also one of the 21st Century risks that is least understood by the public which in the information age can lead to fear and terror and a host of relating political, social and economic consequences. Q: So is there much being done to create greater awareness of CBRN? A: I think there is. Largely through initiatives and cooperation between major international organisations and governments, there is a well funded EU/UN CBRN ‘institutional capacity building’ effort in full swing, while INTERPOL, in addition to other important work, continually add perspective by tracking and notifying real incidents to a fairly wide audience. All this is bringing greater defence and security understanding in areas of the world that hitherto have not viewed CBRN as a significant risk. From the perspective of the Western world, there have been several recent, and dare I say ongoing reminders, of the need to carefully reassess CBRN risk. In the security domain, we have seen that not being able to properly respond has had the most tragic humanitarian consequences and major political impact. In Defence, a lack of capability portrays weakness; weakness reduces your options and at the same time attracts exploitation, therefore the need to demonstrate that you can not only survive but continue to operate under threat of release, or actual CBRN release itself, whether by a state, state proxy or terrorism, or release through some other form such as accident, natural disaster, neglect, criminality and so on. At the same time, Defence is also likely to have an important contribution to the civil community in a major calamity or in specialist areas in the event of isolated security incidents. CBRN decontamination has a key role to play, providing a duty of care at an individual level, while rapidly rehabilitating a return to normality, so you can get on and do the things you need to do, safely and unencumbered, whether at home or abroad. Q: If you think about it, doctrine is all about winning formulas. What would you say is the winning formula for Cristanini and are you any different from others in the industry? A: Broadly speaking, I would say it centres on the decontaminant itself, what it is able to do, how and under what conditions, and the machine, logistics, manpower and workload required to deliver it. If ever there is an example of stove piping science and technology, it is, unfortunately, in CBRN decontamination and the tendency to forget that the operator already has his or her hands full with physiological and psychological challenges in already complex and dangerous circumstances. Cristanini has spent a great deal of time and investment in Research and Development. However, I think that what marks us apart from others is that we have not just focused on scientific and technological solutions. Crucially, we have always included the operator on that R&D journey, to ensure that our equipment and decontamination solutions remain practical and relevant during complex, physiologically demanding and very dangerous circumstances, far removed from the laboratory. Reducing the logistic footprint and the burden on the operator while delivering multi-functionality offer assurance when you really don’t know when or where the next crisis will manifest itself. Operational and resource management was also considered a key part of the R&D process; delivering greater speed and flexibility to a range of interested parties; commanders, operational planners, logisticians, deployed units. The logistic footprint is critical to any deployment. It starts with volume and weight – everything you deploy in an emergency comes with a priority and when the operations and logistics staff get together, they come up with a ‘Desired order of Deployment’, that is seeking to deploy as much as possible as quickly and efficiently as possible, in the right order. It all boils down to achieving assurance and effects with the minimum means and effort – about doing more with less. In one past major deployment, I well recall CBRN assets being pushed down the order of operational deployment solely due to the size of their logistic footprint. Q: In the past, you have referred to the Contemporary Operating Environment. Did that mean you had to adjust in any particular way from what you have been doing in the past? A: Keeping a close eye on the future has always been very important for us. Most academics agree that future operations are more likely to be conducted in an urban or semi-urban environment; also that an agile adversary may seek to develop complex CBRN incidents that may involve a combined chemical and biological or radiological release, or any combination thereof. So for us, speed of response and our multifunctional solutions form an intrinsic part of our philosophy to overcome these challenges. It is not so long ago that the former Director of the United States’ Edgewood Chemical and Biological Centre wrote “We can’t afford to have multiple decontaminants. That is the bottom line. We have to have one decontaminant that can do all chemical agents, all the biological agents.” I feel we already satisfy that requirement with our independently tested and universal ‘BX24’ that is scientifically proven to detoxify both chemical and biological agents and polarize radiological particulate. This has a huge impact on streamlining training, operational procedures, logistics and supporting through-life capability management and relating cost benefits, but above all it brings a real improvement at the operational coalface. If a respirator and suit can protect the operator against multiple types of hazards, why should decontamination be any different? Q: So it is clear you have a fairly universal decontaminant. What about the hardware that is required to deliver it? A: Contemporary military doctrine has also played a very important role in the development of our equipment. Looking at the past, the traditional Cold War three-phase vehicle decontamination operation of pre-wash, application of decontaminant and rinse required three separate stations, several operators, a number of washing and applicator machines, separate generators, hoses, a range of diverse decontaminants, different components and pre-mixing, and a massive logistic footprint to support the entire operation. The result was an over complex, time consuming operation, a significant operator burden, a massive logistic footprint and in our mind safety concerns, both for the individual and the environment. The Sanijet System delivers a radical 21st Century solution. 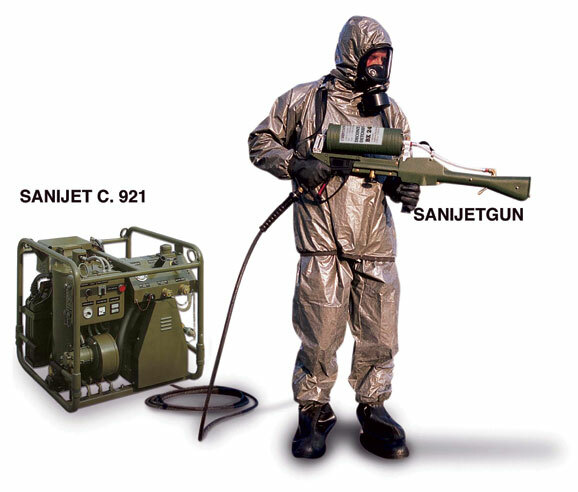 The system delivers the universal decontaminant BX24 though the Sanijetgun. The gun itself acts as low or high pressure water lance, and uniquely is also the chemical and biological decontaminant applicator; thus one operator, one machine, one hose and one decontaminant to wash, apply decontaminant and rinse; as well as facilitating both washing and application of decontamination in one location. This ensures that you wash and detoxify while working with the same equipment, delivering greater on-site safety for operators and the environment, instead of working amongst and storing up large quantities of lethal and injurious toxic substances and vapours. Q: So that takes care of your vehicles. I am wondering if you have any solutions that you feel are particularly relevant to easing the burden on the soldier in decontamination of his personal equipment? A: Yes, this is all part of the R&D quest for reducing logistic and work intensive norms that have really not changed since the Cold War. So, we looked for alternative methodologies for cleaning personal equipment, based on R&D in the commercial cleaning field and specifically, capturing the ‘power of steam’. The parameters we set ourselves for delivering a steam decontamination capability were simple – no more machines! More machines means more spare parts, maintenance, training, documentation, time, cost and so on, so we needed to exclude that. If you think back to the old adage ‘boil the water before you drink it’ and what is referred to in commercial and environmental cleaning as ‘steam cleaning’, then we are on the right track as far as explanations go. Our Sanijet machine can deliver steam to a temperature of 200°C and we recognized that if we were able to capture that, we would also alleviate the challenge of achieving decontamination in sub zero temperatures. The result was the steam tent, of which we now have two versions. The smaller arose from a special forces officer who remarked that they were looking for solutions for decontaminating operators and their equipment with as small a logistic footprint as possible. He stressed that showering was important, given some of the places they found themselves in; like diving in contaminated water, drains, sewers, let alone becoming contaminated with warfare agents. Thus was borne the tactical steam tent which also, given minor adjustment, converts to a tactical shower unit. For company level operations and above we produced the Equipment Steam Tent. In both cases we were able to harness steam and, with appropriately regulated high temperatures, achieve complete decontamination of equipment in 20 minutes. Moreover, in addition to enhanced speed and simplicity, we achieved internal temperature regulation for decontamination regardless of the external ambient temperature. Tactical Steam and Shower Tent: decontamination for operators and their equipment. Q: Many would also enquire to what extent your products are in service to reinforce the advantages that you have outlined. A: We are delighted to see our equipment and the relating techniques and procedures in several NATO countries. It is proper testament that we actually see our products currently deployed in many of the world’s hotspots, for instance, supporting munitions disposal in Iraq and Libya, initially deployed under the auspices of the OPCW. We are also protecting iconic sites and critical infrastructure in European capitals, in the Middle East, South America and elsewhere. We are providing important assurance should something untoward happen at some major global sporting events, as well as providing assurance and deterrence to Armed Forces all over the world. We were delighted last year, for example, to see the United Kingdom procuring our Sanijetgun and BX24 decontaminant and a leap in sales in the Asia Pacific region where a light workload and simplicity greatly reduces the debilitating effects on operators in hot climates. Q: Finally, notwithstanding everything you have said, and given CBRN’s low probability, I was wondering whether you think that there is a case that the requirement for CBRN protection might actually be over stated? A: Leaving the tricky question till last! I think there is, but I would quickly qualify that by saying it greatly depends on the sort of equipment solutions you opt for, because what counts on operations also counts in peacetime, but for different reasons. For low probability events like CBRN, in peacetime, manpower and resource requirements must be minimized, along with the logistic footprint, storage and so on. Training always comes with costs too, so must not demand a disproportionate amount of time and resource. This will also ensure that crew skills can be fine tuned at very short notice. The number of machines, spare parts, maintenance and repair bills, the amount of documentation will also come with financial and administrative as opposed to operational penalties. So like all things in life there has to be a balance and if you can balance the operational benefits with a proportionate peacetime resource requirement, then I don’t think there will be any complaints!